Variety may be the spice of life, but too much variety in our food can cause you to overeat. 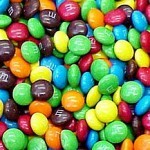 In one study, moviegoers given M&Ms in 10 colors ate 43 percent more than those who were offered M&Ms in just 7 colors. We eat with our eyes, and our eyes trick our stomachs. The more colors we see on a plate, the more we eat. Moviegoers given an extra-large bucket of stale popcorn will eat up to 50 percent more than those given a smaller container of popcorn. Size matters. Another study found that, hungry or not, people will eat more food if the food is in a clear bowl. Today’s tip: Time for a kitchen makeover. Buy smaller plates; 9 inches is a good size for a dinner plate and make sure you don’t buy clear glass, go for the opaque plate. Quit cooking so many side dishes- keep it simple.